We are actively engaged in manufacturing, exporting and supplying an excellent range of Instant Adhesives, a quick fix solution that is used between any two surfaces to form a strong and everlasting bond. These adhesives are processed using high quality chemical compounds and modular technology, in compliance with set industrial norms. The offered adhesive is applicable in various industries for pasting and sticking purposes. Moreover, we offer these adhesives at budget friendly prices and deliver within the promised time - frame. Fasto Instant Adhesives cures by reacting to small traces of surface moisture. Cyanoacrylate Adhesives cure very quickly at room temperature, eliminating the need for costly ovens or curing equipment. Gap fill ranges are 0.015 mm (0.006") to 0.5 mm (0.02"). Temperature resistance ranges from -60 to 110� C.
Major Applications includes bonding of various substrates like metals, plastics, rubbers, cork, ceramic and many more. They found their applications at General Industries, Automotive Industries, White Goods Industries and etc. By keeping track of current market development, we are offering an excellent range of Cyanoacrylate Adhesive. The offered adhesive is processed by using superior quality chemical compound and sophisticated tools, under the supervision of skilled professionals. Apart from this, the entire range of adhesive has various features like solvent-free and non toxic. We offer this adhesive at pocket friendly prices and deliver within stipulated time frame. 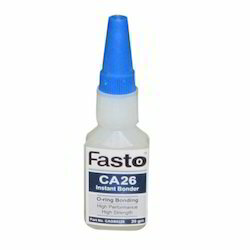 Fasto CA26 is a low viscosity high strength fast curing specially formulated modified Ethyl Cyanoacrylate adhesive. Fasto CA26 is suitable for bonding difficult to bond substrate like paper, leather etc. Fasto CA26 is very fast curing for substrate like rubber & plastics.